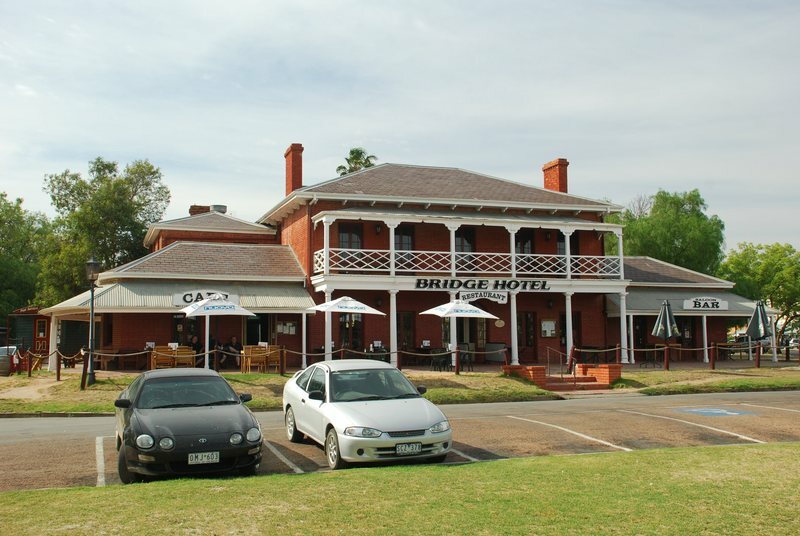 The former Bridge Hotel was erected in 1858 for Henry Hopwood, who located his new establishment close to the site of his ferry and pontoon bridge on the Murray River. It was built on a site intended by the initial surveyor Philip Chauncy and Hopwood, to form the centre of the township of Echuca, now facing an open area known as Hopwood Gardens. Hopwood arrived at the junction of the Murray and Campaspe Rivers in the late 1840s, and by the time the proposed township of Echuca was completed in November 1854, he had already built his first hotel near the ferry crossing on the Campaspe River. Hopwood acquired extensive tracts of land at the first sales in 1855, including five prominent corner sites in High Street, and in this way played a key role in the future growth of the settlement. 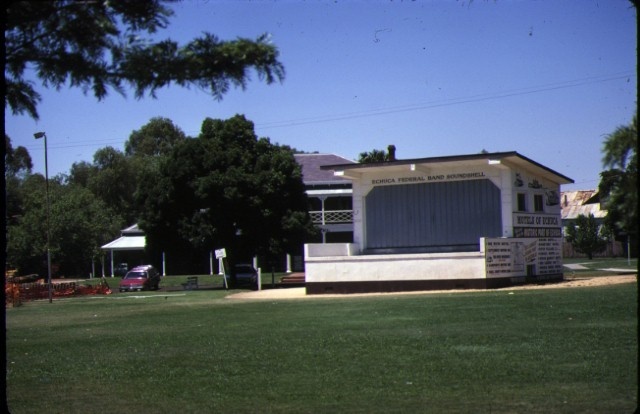 The early growth occurred as the river trade developed, and by 1859 the first two hotels had been erected in the township of Echuca. The Echuca Hotel was opened by Thomas Mitchell in September 1858 in High Street, and this was followed by Hopwood's Bridge Hotel in March 1859. Echuca became a municipality in 1864, and the construction of the railway line from Melbourne in that year, and the construction of the wharf from 1865-7, ensured the development of the city. 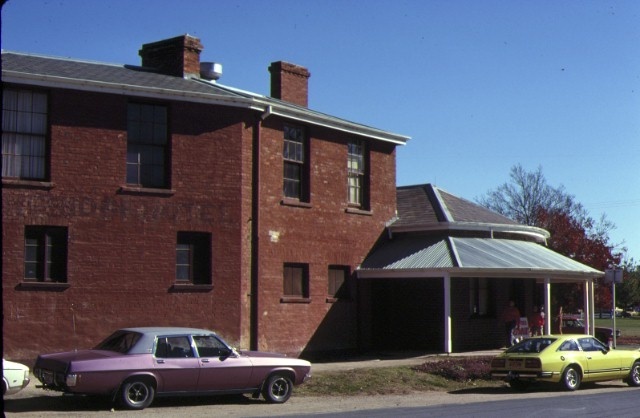 The Bridge Hotel remained licensed until 1916 when it became a residential establishment, and it was sold to the City of Echuca in 1970. The slate-roofed, brick hotel is an unusual freestanding building which comprises a central two storey hip roofed section, flanked by single storey hip roofed wings with curved ends. The central section has a double storey timber verandah with fluted timber Doric columns at ground level and the flanking wings have single storey posted verandahs. Tenders were called for the erection of a kitchen and other additions in 1875, and this is probably the two storey brick wing constructed to the rear of the east side of the building. The building was extensively restored in 1975 as part of the Port of Echuca Restoration Project. The former Bridge Hotel is of historical and architectural significance to the State of Victoria. The former Bridge Hotel is of historical significance as an outstanding and intact element of the important nineteenth century river port precinct of Echuca. 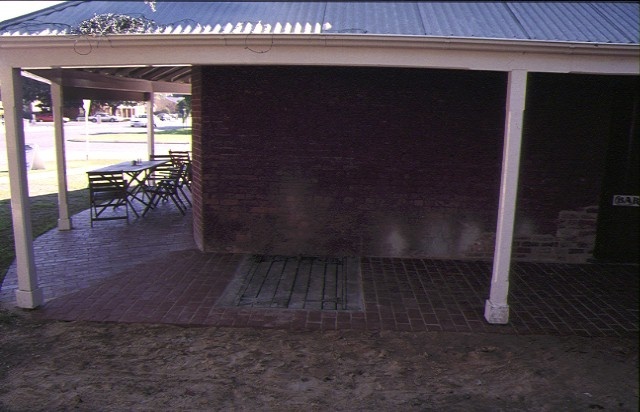 It is one of the earliest buildings constructed in Echuca and, together with a number of other historic buildings, it is illustrative of the development of Echuca from the 1860s as an important Victorian port. The former Bridge Hotel relates to the very beginnings of this river trade. The former Bridge Hotel is of historical significance due to its association with Henry Hopwood, a prominent entrepreneur and leading citizen during the early years of Echuca's development. It is the principal building recalling Hopwood?s presence in Echuca and occupies a prominent site overlooking the Hopwood Gardens. The former Bridge Hotel is of architectural significance as an intact example of mid-nineteenth century hotel architecture in Victoria. The single storey curved flanking wings are an unusual feature of this freestanding hotel building. City of Echuca. No. 145. Hopwood Hotel, 642-648 High Street, Echuca. Hopwood arrived at the junction of the Murray and Campaspe Rivers in the late 1840s, and by the time the proposed township of Echuca was completed in November 1854, he had already built his first hotel near the ferry crossing on the Campaspe River. Hopwood acquired extensive tracts of land at the first sales in 1855, including five prominent corner sites in High Street, and in this way played a key role in the future growth of the settlement. The early growth occurred as the river trade developed, and by 1859 the first two hotels had been erected in the township of Echuca. 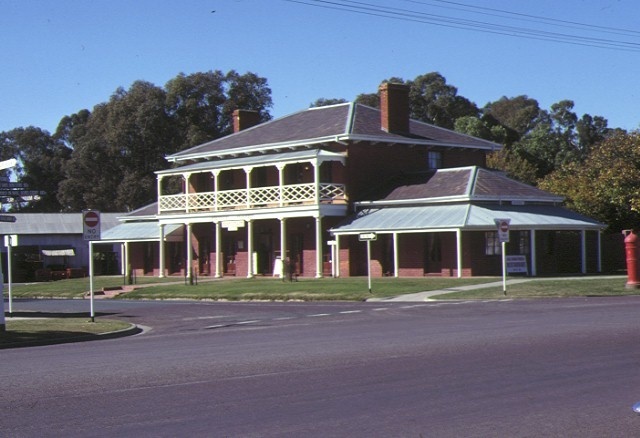 The Echuca Hotel was opened by Thomas Mitchell in September 1858 in High Street, and this was followed by Hopwood’s Bridge Hotel in March 1859.